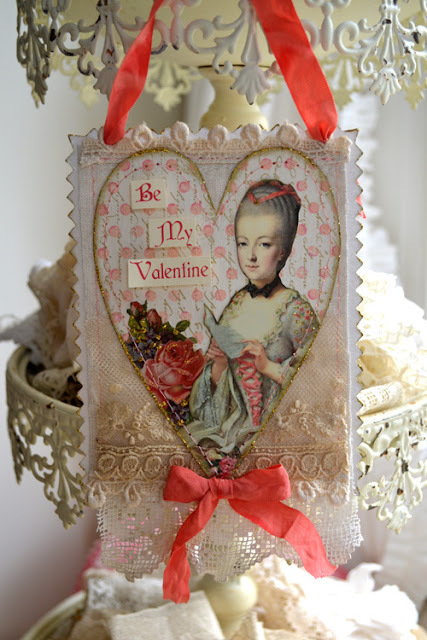 Artful Affirmations: Tea Cup Tuesday-Valentine's Day! 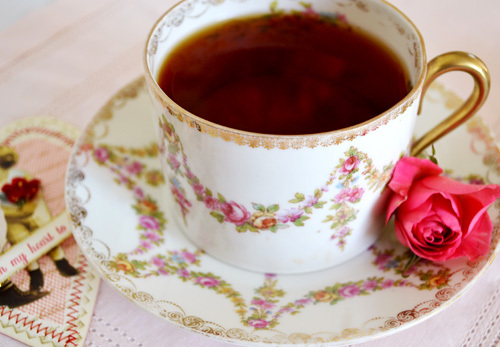 Today is a day well suited to the romance of tea and a beautiful tea cup! This is one of my very favorite cups. I bought it upon returning home from Paris, I thought it looked very similar to a cup displayed at Versailles that had belonged to Marie Antoinette. I adore the swags of flowers! The plate is just as gorgeous as the cup. I have held it at an angle as I photographed it as the light was shining so beautifully. Hence the two tones of color. A very simple matte gold handle. Just perfect for this coffee can shaped cup. 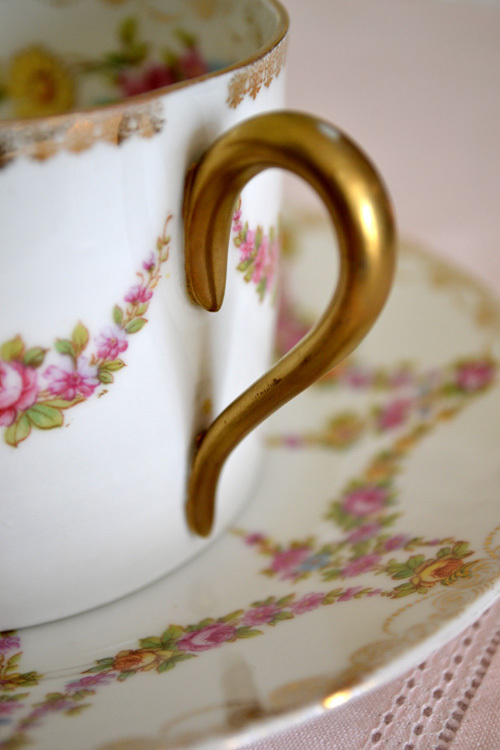 The beautiful gold stamping around the edges of the cup is so sweet, and it is worn from use. The handle too show wear of being well loved. That makes this cup extra special to me. Would you like a cup of Romance? How about a romantic indulgence? 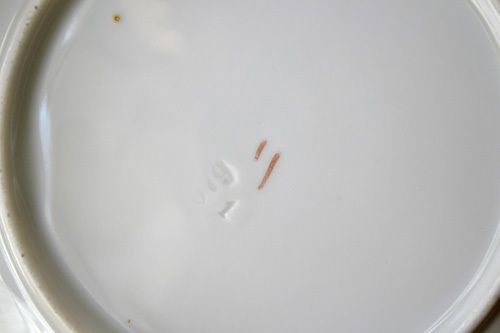 The backstamp on the cup has a few numbers stamped in...looks like 079, then the number 1 on it's side underneath. The two ticks in gold are likely an artists mark? 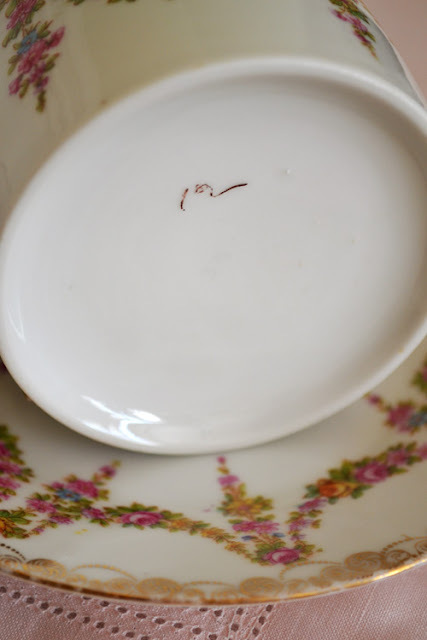 The cup is only marked with this little black squiggle that looks like it could be an initial? I like to imagine that this cup was manufactured in France. It seems more romantic that way! I have a giveaway that has just begun! at Creative Workshops, or a Crafty Secrets Illustration CD! May you all feel the LOVE that you are! Have a wonderful Valentine's Day Terri! That is one of the prettiest teacups I've ever seen. such a mysterious romantic teacup... I wish you a lovely Valenine's Day! The swags give it a royal look. Also, the colours are so pretty! Love the teacup, Terri ... and the Valentine's are marvelous! Happy Tea Day and Happy Valentine's Day! I love the teacup! It is so French! And the Valentines are so sweet! What a gorgeous teacup! I can see why it is your favorite! Happy Valentine's Day! Thank you for hosting! Sweeeet teacup...and lovely valentines... Happy V Day! Thank your for the visit. I loved looking at your beautiful teacups and joining in. Thanks for following. I love your teacup! It simply delights one to look at it. Coming from Paris makes it especially sweet, with fond memories attached, I'm sure. It's the perfect cup for Valentines Day. Thank you for sharing this beauty with us and I hope you have a Happy Valentines day. 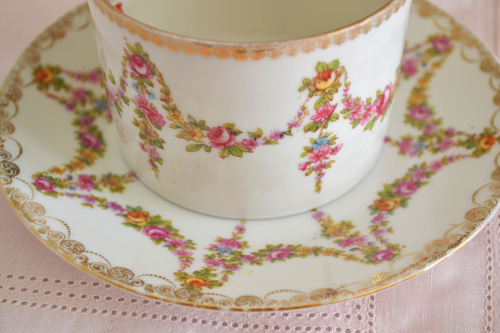 A beautiful post and a gorgeous teacup set! Thank you for hosting and have a great week. Hello Terri, Thank you so much for hosting this Tea Party. I am your newest follower and am so glad to be able to be at your party. I love your teacup and the darling Valentine sitting in it. The cupcake looks extra yummy too! Happy Valentines Day to you and your loved ones. excelente compra que fez em sua viagem! detalhe da guirlanda e cor ouro da alça são perfeito! Happy Valentine's Day Terri, and thank you for always sharing some beauty with us everyday! Your cup is fir for a queen....soooo pretty! Ops! Sorry my link appears twice. It vanished the first time. I guess it was just hidding. I think your teacup is gorgeous! It is very romantic with all the little flowers and it's design is lovely. I agree with Kristin, it is one of the prettiest teacups I've ever seen. congratulations to you and Martha for 100 posts Tea Cup Tuesday. Your cup is really lovely. I can imagine that Marie Antoinette would have loved it, too. Very dainty and feminine. I always enjoy the fabulous photos, you make. You show always very clearly the best of every tea cup. I am still so happy with your giveaway. Thank you so much for this weekly fun party and for sharing your treasures. Your teacup is so lovely and just perfect for a Valentines day tea. I love the flowers and swap. What a beautiful cup for Valentine's Day!!! Happy Valentine's Day, Terri. Thank you so much for all the tea fun. 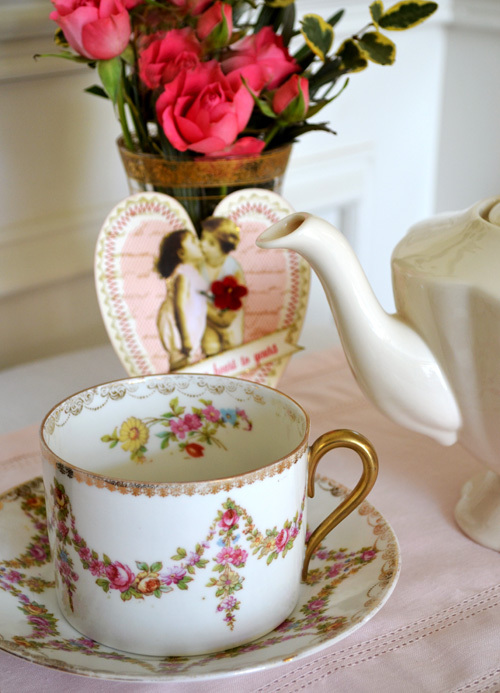 Your cup is so precious and there's nothing like a romantic teacup to set off Valentine's Day. I love the thoughts of France! Some day I would love to go there. Your cupcake looks very inviting!! 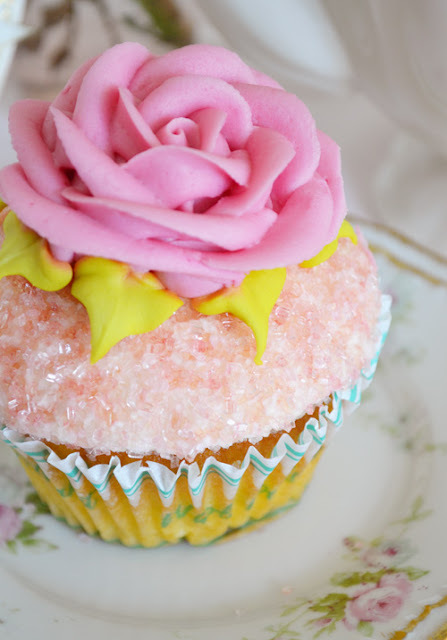 The photo is perfect to show off the sparkling sugars. I hope you have a most lovely day. Hi Terri, Your tea cup and saucer are lovely. Oh, I think I gained 10 lbs. just looking at that cupcake. lol! Have a wonderful Valentines! I am now following you. What a beautiful teacup you brought back from Paris. It's easy to see why it is a favorite. The cards are gorgeous too. Oh my Terri - your post is stunning. It makes me so happy to visit you!! I agree with one of the previous comments that this has to one of the prettiest cups I have ever seen - what treasures are in your home! I shouldn't even have to tell you I love that picture of the gorgeous cupcake! Happy Valentines Day! Oh my! what a beautiful teacup you have there! it's so romantic and i do adore the swag of flowers on it and i love all the photos you took, the cupcake looks beautiful and yummy! Thank you for sharing and hosting! 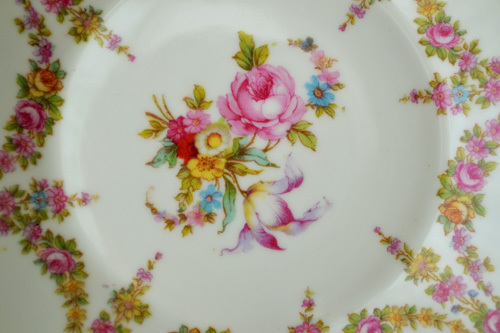 you are sharing one of the most gorgeous teacups...as always! This is another beautiful post, well suited to celebrate the 100th Tea Cup Tuesday. Congratulations! Today's cup is gorgeous, very rich and elegant, and you always photograph all the details so well! The Valentines are also delightful! I love your tags for Valentine, and wishes you a beautiful day. A lovely cup with an interesting shape. It almost has a contemporary shape to it - but the swags and flowers give it the definite vintage touch! and, YES! I hope you entered me for the bracelet and CD give-away! Ohhhh so sweet! :) Lovely cup and sweet Valentine art. I hope your Valentine was good to you m'dear! So very very beautiful! I cam see why you fell in love with it..me too..how I'd love to sit and have a tea with you!! Enchanting..your photos are also super magical Terri!! Hugs and thanks for all the magic you continually share..you are awesome! Terri, I just love your vignette of the beautiful teacup/saucer with the teapot spout, roses and valentine. How delicately pretty. Thank you for visiting, it was a such a pleasure to read your comments. I hope you had a delightful Valentine's Day. I wish you lots of love every day. 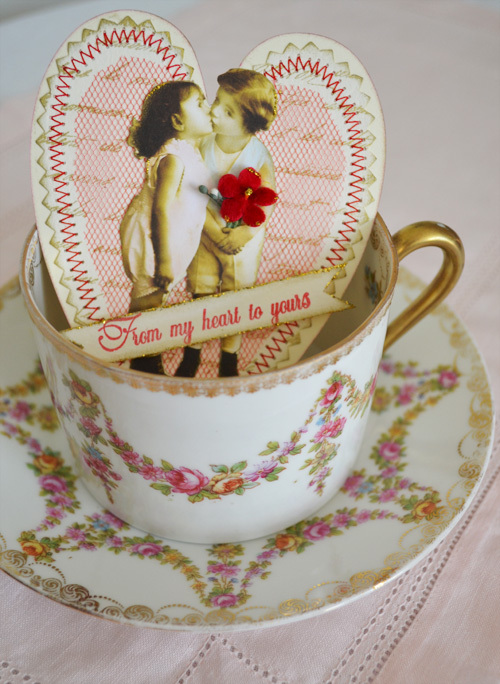 Terri, this is an especially pretty and very appropriately designed teacup for Valentine's Day!